Stage One: I am in a perfect position to succeed. My client is pleased with my proposed thumbnails (and why wouldn't they be? ), so they have all been approved. Freedom is mine! Choices abound; the opportunities are endless! Verily, there is nary an obstacle in sight! Stage Two: I have consumed four cups of coffee - for reasons purely associated with efficiency and NOT chemical dependency. I am a person of my word. I am young and hopeful. There is time yet for a Netflix movie or three. Stage Three: I always knew that being an Artist Of My Word would bring pain someday, and that is why I have come prepared with a massive collection of queued-up podcasts. These podcasts will surely rejuvenate me. If not, there is always caffeine. Stage Four: I have consumed thirteen cups of coffee. I am now at 97% Optimization. Two more podcasts and I will be at 99.9% Optimization. Sleep is out of the question. Stage Five: It appears that I have forgotten how to hold a pencil. I'm not sure if I've ever drawn a proper thing in my life. What IS art, anyhow? Who is to say that life itself is not a work of art? Whom am I trying to please, if not my own sense of righteousness? Stage Six: Oh, right - the client. They have asked me for 27 revisions as politely as possible, as soon as possible. I didn't want to sleep anyway. Stage Eight: Are we human? Or are we denser? I think we're denser than this piece of dry toast I'm eating for - oh what is it now? Brunch? Lunch? Sad dinner? At this point, it's just drawing fuel. I am an art machine that runs on college food and last minute panic. I had pocky for breakfast, bacon for lunch, and popcorn for dinner. My drawing hand is moving steadily, irrespective of my motives or brain capacity. How then, can it possibly be a lie when I text you, “it’s nearly finished,” when I wish so deeply for it to be true? Stage Nine: I can no longer identify the tangents in my drawings. I flipped my canvas horizontally, and everything became instantly worse. My life became instantly worse. I am a worthy art professional full of professionalism and artistry. At no point during the making of this piece did I want to scream into the void or drastically alter my profession. Thank you for working with me. I shall sleep now! At long last, here are some pictures of the Wing Luke "KidPLACE" children's book exhibition that I worked on - my biggest collaborative art project to date! For the past 10 months, I worked closely with a small planning committee at the Wing Luke Museum (a historical heritage museum devoted to Asian American culture) to plan, design, and install the exhibition. Our team had free reign to transform a 10'x12' room into a lush, forest-themed exhibit titled "Tales of Tails." I was responsible for creating many of the printed designs as well, including the text panels and the reading panda illustration. This project was headed by Minh Nguyen and involved many talented contributors. My friend Rodney Bambao did all the production design for this exhibit, even going as far as building a to-scale diorama of the whole thing! My friend Ken Taya did a bunch of the cute animal art, and I also roped in my husband Sam LaMonica to write all the text panels, since he works as an educational writer. On opening day, I led a 2 hour art activity for a large classroom of children. The best part of that was after my art demo, when a bunch of the kids lined up to try out the digital tablet I brought. 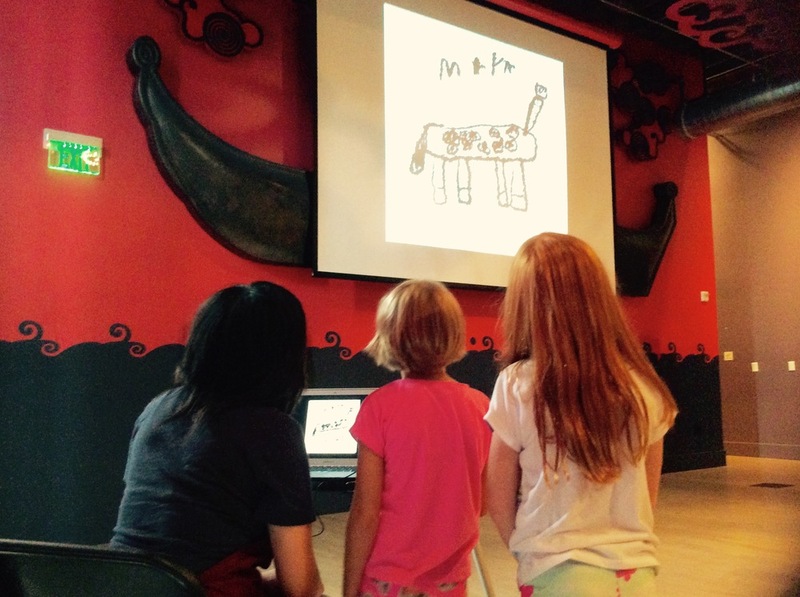 It was so much fun watching kids live-draw their favorite animals on the projection screen! It really lit a fire in me and I definitely want to pursue more teaching opportunities in the future!